Hi Deb and welcome to the forum, it's great to have you here. 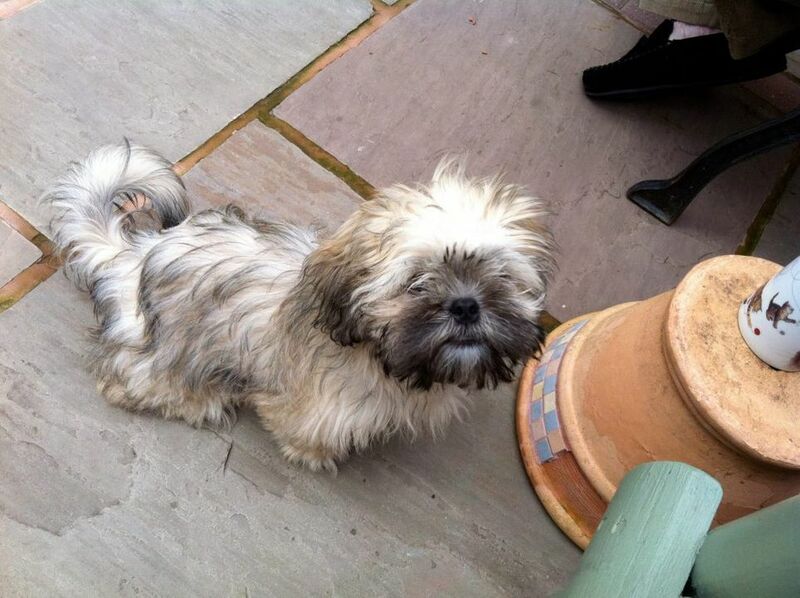 We are a very friendly bunch of shih tzu addicts so you should fit in very well! Sorry to hear you have just lost poor Teddy, but as you say I think he may have helped find Daisy for you. If there is something that isn't covered then please ask and we will try to help you. It sounds like Daisy is having fun in her new home, and settling in very well, though I don't think the cats would agree with that at the minute. I am sure they will let her know when they have had enough. We love to see photos so please upload some of Daisy for us to see, she sounds like a typical fun loving shih tzu puppy to me. Thanks for the welcome and info. @Lyn Thats what Dolly does. She pees in the house a lot. I'm worried about using the puppy pads now because she rips them to shreds and Lord knows what would happen if she swallowed them. I've ordered a couple of those frame things that fix them to the floor - hopefully that will solve the problem. Hi Dollysmum, I haven't used the puppy pads as I was reading up on the Victoria Stilwell forum and they don't seem to think they are a good idea as it encourages them to think it's 'okay' to pee indoors. I think as long as they are taken out every couple of hours, age dependant of course, then in theory they should begin to realise indoors is a no no. Daisy is dry all night and has been since we got her at 20wks. The food issues certainly are an eye opener. Having only had a labrador before Daisy we are used to a dog who will eat anything. Daisy never eats her food right away. We put her food and water in her crate and put her in there and let her get on with it and it usually takes her about 5mins before she starts to eat and she often leaves a bit which we tend to let our labrador finish off. Ted would snaffle the odd cat poo if I wasn't quick enough emptying the litter trays (covered ones) I have learned to be super fast, uber efficient mum to furriness. Just beginning to wonder if it is me that has been house trained in this instance. Shih tzu are hoovers and will gobble anything as long as it isn't their own food. Poo, be it their own or other dogs and cats is a favourite, maybe it is because we all react so quickly when we see them do it? Only kidding, I know it isn't! Just be ultra quick at cleaning up and she should eventually grow out of it Lyn. It took Simba a long time to get the message, but he hasn't tried any for a long time now thank goodness. Fortunately neither of mine have eaten their poo. Except when we take them on the mountain walk where there are a lot of sheep Mali has eaten sheeps poo. But I have been told it is very good for them -sheeps poo that is. As for the poo munching Maggie and Henry used to do it an sometimes still do they will grow out of it or learn not to do it after a while I know what time of day mags normally goes so can just be around then so not always waiting I am sure when they get the hang off house training u will find this to ! Mags used to bring it in horrible monkey ! It is great fun (or maybe NOT) having a new puppy in the house I am sure Teddy was there guiding you to Dolly. She gives me a guilty look, least that is how I see it. We walked both dogs tonight, came home and I took Daisy into the garden as she had only done a poo on her walk so I knew she would need to pee too. She then rushed off and next thing I knew she had picked up a bit of our labradors poo that I hadn't even noticed was there. She only managed to get a bit of it but she did seem to have a guilty look on her face, or maybe like you I just have an over active imagination with it all. Ah so thats the reason. Dollysmum wrote: Ah so thats the reason. I'm amazed the cat stands it! Mishka our labrador won't let Daisy anywhere near her bed when she is in it! 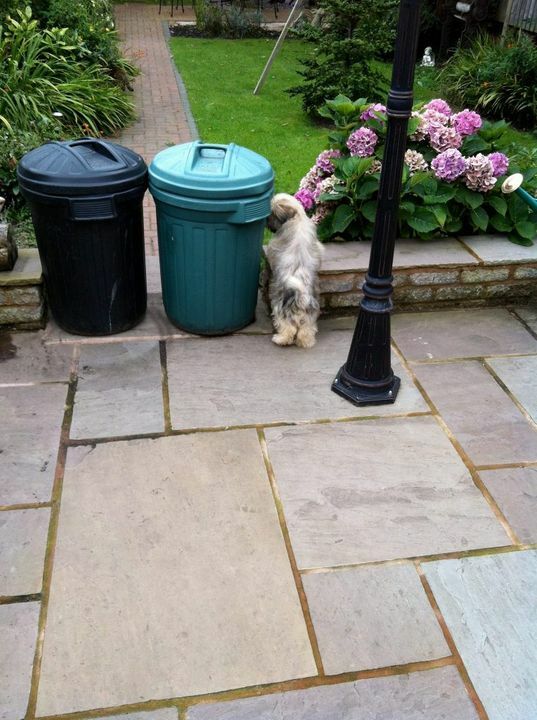 It looks to me as if you are going to have to be more inventive to stop her getting into the garden!!! 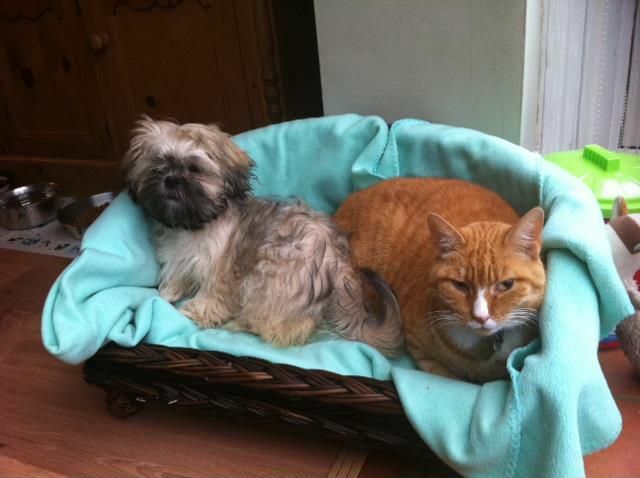 I love that photo of her with the poor Will, who says dogs and cats don't get along?